Living Games, Dangers Untold, Bundle of Holding and More! Every time I feel like I have to say ‘it’s been a while’ when I start a blog post here. Fact is, I fell out of the practice of posting at least once a week because of the amount of work I’ve been doing lately. I don’t mind saying it’s been a lot, so posting on my own blog about what’s up has fallen by the wayside. I want that to change, even if it’s just some basic updates. So, what have I been working on? Let’s talk about it all. Let’s talk about all of the things. 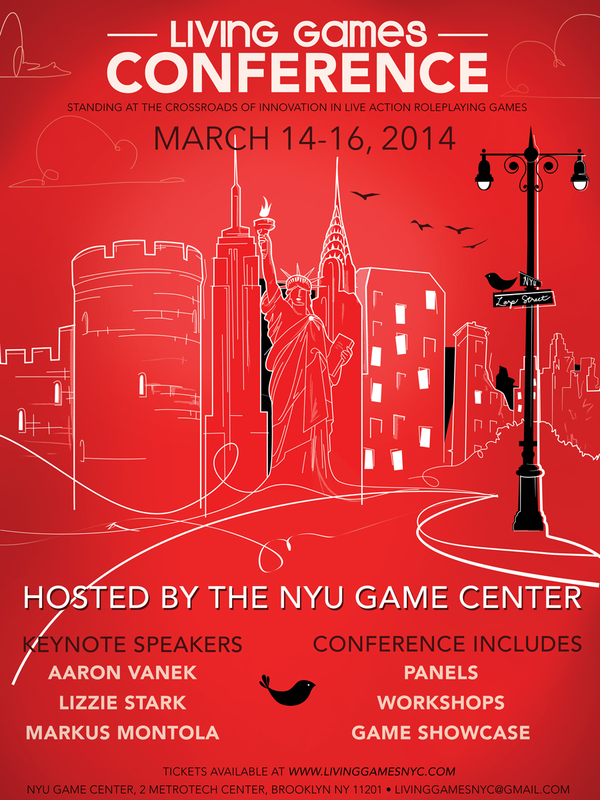 The Living Games Conference is my graduate thesis project at the NYU Game Center. It is a live action role-play academic conference being hosted at the Magnet Center in Brooklyn March 14-16th. We are the very first Tickets are on sale as the event is one month away. We are looking to have talks and workshops by designers from around the world come together in NYC to talk about the future of LARP and innovation in the field. The schedule includes keynotes from Lizzie Stark and Aaron Vanek with our third keynote soon to be announced (hint: it may be on the poster already, but shhhh)! Plus, we’ll be hosting a showcase of games on Saturday night that will let people get a look at the kind of games there are out in the world. Part of doing this conference has involved getting funding together for various things, including and especially documentation of the panels. For that reason we’ve reached out on IndieGoGo to help with getting equipment and such. If you can, we’d appreciate any donations you might be able to make – every little bit helps. Plus there are some fun perks. It has been a real pleasure working on this conference. I’ve learned a lot about event organization as well as the things I believe are most vital to the LARP community going forward. You’ll hear more about the conference as we approach the date in the next few weeks, but meanwhile check out the website for more info, buy tickets here, donate or follow us on Twitter @LivingGamesNYC. Dangers Untold is a project I am so happy I got to work on, and now it’s live on Kickstarter! The game is a freeform LARP out to give folks a chance to tell the stories of the Heroine’s Journey. Like Labyrinth or Alice in Wonderland? Ever wanted to fall down the rabbit hole and explore adventures as a heroine out with her friends, Dorothy on the road through Oz? This game is for you. The goal was to create a game that could be played with people 12 and up, a game parents could play with their kids and kids could play with their friends. I designed the LARP based on my experiences with alternative, mechanics-light games with the intent on it being accessible to non-LARPers and seasoned vets alike. Mostly, I just kept in mind an experience I had running my LARP with the pre-teen daughter of a friend. I remember watching her eyes light up at the experience and realized not many games are accessible for younger audiences. Plus, how many times in games do you get to play with a girl protagonist squarely in mind? That was the aim of this game. Produced by Josh Jordan and Ginger Goat Games based on Josh’s fantastic tabletop game Heroine, we’re looking to produce a beautiful book with photos by J.R. Blackwell and layout by Daniel Solis. The Kickstarter is up and running so come by and give us some love and help us make this great game possible. It has arrived! Bundle of Holding has put together a collection of fantastic freeform games and I am so honored to have my first freeform, SERVICE, available among them! My game is alongside work by fantastic folks like Jason Morningstar, Lizzie Stark, Evan Torner, Meguey Baker, Emily Care Boss and more. These games are amazing introductions to LARP for those who want to give the form a try but were concerned about long, complicated rules or ongoing campaigns that require a lot of gear. Freeform gives you a chance to create experiences that are personal, smaller, and easier to jump right into. This is the first time that SERVICE is available to the public since it was produced initially earlier this year, and I’m excited to see it played elsewhere. Meanwhile, you’ve got a week to get your hands on this fantastic Bundle of Holding! Whew, told you I was busy! Between that and some other projects, it’s been a busy winter so far. I’ll also be talking in another post about places you’re going to see me working with others on some fantastic LARPs and panels soon, including IndieCade East which is this weekend! So stay tuned to more about the work going on and check out the IndieGoGo, Kickstarter, and Bundle of Holding above!